UPDATED – JERUSALEM (CNS) — Sometimes, news is not just what meets the eye on the TV screen or a social media post. Catholic political analyst Wadie Abunasser noted that while neither Israel nor the Palestinian political movement Hamas is interested in starting a war at the moment, both are interested in delivering strong messages to the other side on various issues being negotiated through backdoor channels. Internal politics also contribute to the situation, he said. One issue on the table, he said, is a prisoner exchange being negotiated by the Egyptians. The exchange involves the bodies of two Israeli soldiers held by Hamas since the last Gaza war and three Israeli civilians — an Israeli-Ethiopian and two Israeli Bedouin — held by Hamas. All three civilians crossed into Gaza willingly, and two have mental health issues. Egyptian negotiators are also at work trying to calm the current situation, he said. The demonstrations were first called to protest the U.S. embassy move to Jerusalem, and to mark the 70th year since al-Naqba, or what Palestinians call their catastrophe — the creation of the State of Israel. “We are talking about two neighbors who dislike each other,” said Abunasser. The status of Jerusalem was one of the issues to be discussed when the two sides finally returned to the negotiating table, and neither side was to take unilateral action, he said. Though it was the U.S. decision to move the embassy, Israel is seen as having lobbied strongly for it and for the relocation of other embassies as well. Abunasser also said internal Palestinian politics is playing a role in the growing tensions. Palestinian President Mahmoud Abbas has been cutting funds to Gaza, which is under control of Hamas, Abbas’ rival. Abbas wants to force the Hamas leadership to comply with his conditions for reconciliation, said Abunasser. He said 2 million people live in the cage known as Gaza, which has been blockaded for 11 years, since Hamas took control there. Much of the infrastructure of Gaza has been destroyed by the Israeli military. Abunasser said Hamas does not want to risk Gazans taking out their anger on political leaders, so it is trying to divert the anger instead toward Israel. Gazans are pawns in the confrontation, he said. Numerous children have been killed in the demonstrations, including an 8-month-old baby, who died of tear gas inhalation and whose death made emotional headlines on both social media platforms and news media. But doctors at a Gaza hospital are now saying that the baby may have had a prior medical condition that may have caused her death. And the question begs asking as to why such a young baby was within the vicinity of the demonstrations where it is known that there is extreme violence. While placards and other Hamas media have urged people to go to the border where tent cities have been set up within range of tear gas volleys, Israel has warned Palestinians to stay away from the border fence or they will be shot. Gazans are but pawns in the confrontation, Abunassar said. While Palestinians have been calling the protests “peaceful,” Hamas leader Salah Bardawil was shown on Palestinian TV saying that of 62 people killed in the Gaza demonstrations, 50 were from Hamas, which is listed as terrorist group by Israel, the U.S. and the European Union. More than 2,000 people have been injured in the demonstrations. Israel has been criticized by the international community for its use of snipers and live fire against the demonstrators. Israel says its soldiers are trying at all costs to prevent Palestinians who would carry out terrorist attacks against Israeli targets from crossing into Israel. 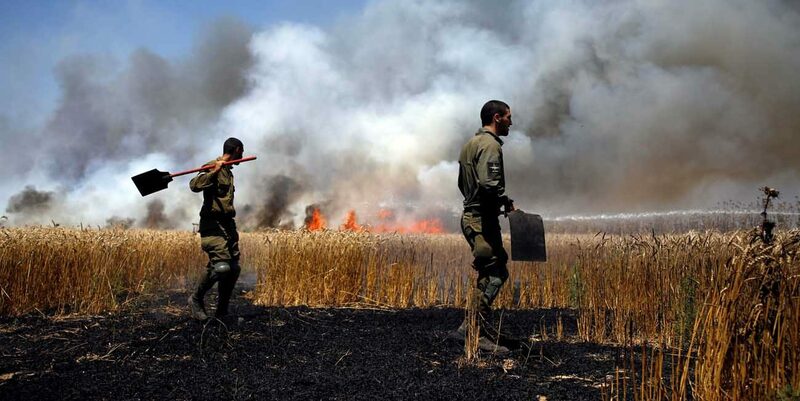 Israel also says millions of dollars of damage has been caused to Israeli crops as Palestinians send kites with Molotov cocktails flying over the border fence, burning agricultural fields. Abunasser said Israelis along the border live under constant tension of such possible attack. Numerous underground Hamas tunnels leading from Gaza into nearby Israeli communities have been destroyed by the Israeli in the past, making the fear of infiltration very real. Gazans, said Abunasser, are under the constant tensions of the blockage, electricity shortages, no work, a lack of commodities and the inability to leave. I think probably there are many Protestant preachers looking the other way on the embassy move from Tel Aviv to the holy city of Jerusalem. Why? Because Derry, the 400 year old Protestant Jerusalem that sits atop Ireland was never made the administrative center for Northern Ireland. Of course, since when would the secular operations of empire have any business within the walls of Derry? So how, within the walls of Asia’s Jerusalem would administrative functions for secular Israel come to be welcomed? It makes no sense. A president of Protestant America should have known better. Demanding the American embassy to be moved to Jerusalem is unprecedented in American history as well the history of Protestantism. Worse still, President Trump’s embassy move comes across as spending government time and money assembling the Middle East to warrant the 2nd Coming of Christ according to Protestants’ peculiar reading of the Holy Bible. Protestantism is rooted in literalism, i.e. non-figurative and non-traditional interpretations of the Bible which de-emphasizes the role of sacred tradition. This is the foundational principle of the Protestant Reformation. World-wide, most Zionists are Protestant, and without British evangelical and German Pietist involvement with Palestine since the 1840s its a wonder if today’s Israel would exist.